Google decided to go with Samsung, instead of Asus who made the Nexus 7, for their larger tablet. Google may have noticed that Samsung have more experience in making good products of that size, against Asus. The design of the Nexus 10 has many similarities with the Samsung Galaxy Tab 10.1, and this may or may not be a good feature, depending on what design you like. In general use, the Nexus 10 feels like a comfortable device to hold in your hands or place on a surface. The tablet has a plastic back with a rubber-like feel for extra grip, which is common on Android devices. We enjoy this rubber texture, despite the tablet feeling very cheap against the iPad’s premium quality build. 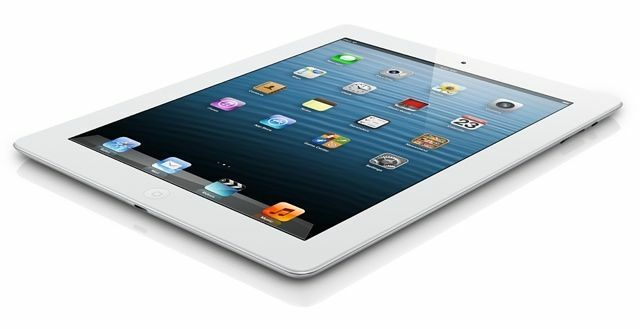 The iPad 4 is the premium quality tablet, with an aluminum and glass design, it looks and feels fantastic. It is the same size as the Nexus 10, although it is a tad heavier. For daily use, the iPad is an ideal candidate, the screen is excellent and works without bugs or glitches. We do find that reading and holding the tablet isn’t as easy as it would be on the iPad Mini or the Nexus 10, but writing emails and using apps that need that extra real-estate is what this iPad is for. The iPad 4 has more premium quality materials and a better build. Despite the rubber back that may be great for some butter-fingered users, it does not clinch a victory against the iPad. In our view, the iPad just feels and looks a lot better than the Nexus 10. You would think that with the retina display being one of the big selling points of the iPad 4, that Apple would have bumped up the resolution to match the next generation Android tablets. This is not the case though, and the iPad display slacks against the Nexus 10. This is still a brilliant and beautiful display that will present colors and text in amazing quality. What Apple loses in pixels per inch they make up for in vibrancy and colour realisation. With a resolution at 300ppi, the Nexus 10 has an incredible display that matches the iPad 4 with retina. When watching a movie, reading an article or playing a game, the Nexus 10 has a beautiful display that makes the images and text look beautiful. In our view, it is the best tablet display out right now, and once you use the tablet you will not be able to argue. The Nexus 10 wins; the higher resolution really makes this a truly great device. Mind you, it does not matter much as both tablets have amazing displays. The Nexus 10 comes pre-loaded with Android’s latest offerings – as a Google product, you will find that your device is updated a lot quicker than any partner devices on Android. Android 4.2 is a small upgrade from 4.1, and both keep the Jelly Bean tag name. In terms of operating system, excluding content and offerings, Google has done pretty well with Jelly Bean 4.2. The OS is fast, fluid and customizable and gives the user many fun features. Unlike iOS, which has had the same design, you can go about changing Android whatever way you want. The iPad comes with iOS6, the newest operating system by Apple for their mobile devices. While we do love iOS for its security, its ease of use and its speed, we cannot help but wonder why nobody at Apple has stepped up to change the platform slightly. We still look at iOS the same way we did many years ago, except now we can put apps into folders. Where Android is customized, bits are added and the experience feels different with every upgrade, with iOS we feel at the same place we were years ago. On operating system, not content, Android wins. iOS may be better for a handful of people that cannot use any system more complex, but users like to customize, they like to personalize and they like an operating system that is fluid and alive. Jelly Bean is not perfect, but it is a better offering than iOS. Apple has a great developing community, one that will build apps for their iPhone and for their iPad. Developers will also work around the bigger size of the iPad and make their apps look more optimized for the larger screen. This is why on the iPad Apps Store; we have a huge collection of quality apps at a very low cost. The iPad has great movie, book and music content too, there are new films added quite quickly after they are finished in cinema. There are a lot of streaming services, magazine providers and other content distributors on the iPad too, via the apps they put out. Unfortunately, Android do not have that type of developer community, at least not yet. Many of the developers for Android do not add their apps to the tablet world and the ones that do put less than ideal apps out for the service. Right now, we are not seeing many top developers bring out apps for the tablet community on Android. Apart from apps, the Nexus 10 has a good selection of movies, books and music. There are not many apps for your third party needs, but Google has more services tailored to bringing you content. They have their own magazine curator and many other native apps. Apple has a lot more apps and the developing community for tablets works harder on iOS. Until Android starts getting millions of committed users, as the iPad has, we doubt developer interest will be there. 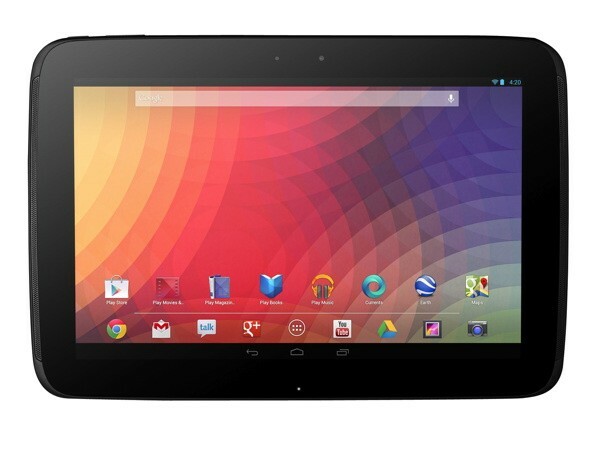 Starting at $399, the Nexus 10 is the cheaper of the two tablets. You can get up to 32GB’s of internal storage and it comes with no microSD card for future storage. Battery life is good on the tablet and speeds are excellent with the dual-core Samsung processor. Starting at $499, the iPad 4 is the more expensive of the two tablets. You can get up to 64GB’s of internal storage, but it comes with no microSD card for further expansion. Battery life is better on the iPad than the on the Nexus 10, at about 12 – 14 hours, the iPad is a little slower than the Nexus 10 though. Price wise? The Nexus 10 wins by $100. An incredible tablet made by Apple, who many view as the Gods of gadgets right now. If you want that premium feel, the content that only Apple provides and a great all round performing tablet, you will want the iPad. We found that the Nexus 10 was the best shot Google and any Android distributor has had at beating Apple. The tablet has a great display, Google’s brilliant ecosystem and solid performance. The only problem is content, and it is a rather big one. 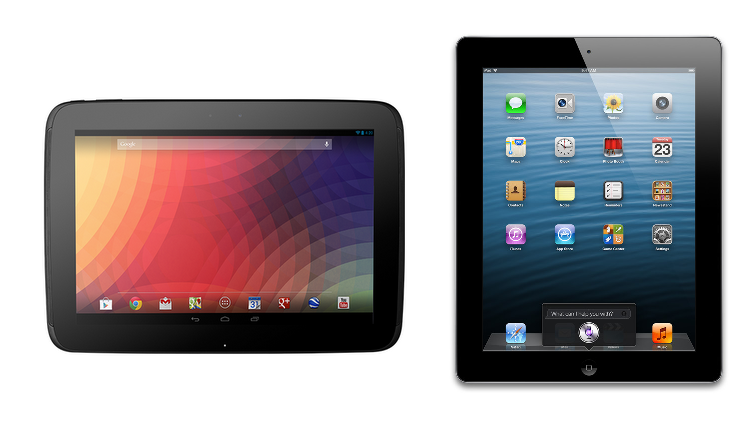 Until Android developers start working on tablets, Apple will keep winning as they have done here with the iPad.